Inflatable pool claims the life of a toddler. Sadly another Australian toddler has lost their life to a drowning. Following a near drowning incident in an inflatable pool in Morpeth NSW on Friday, the 16 month old boys life support was switched off on Saturday and he passed away. Deciding to switch of your childs life support system is one of the hardest decisions any family can ever possibly face and the Samuel Morris Foundations thoughts are with the family and the Morpeth community during this tragic time. It is only a couple of weeks ago that the Samuel Morris Foundation was involved in media to highlight the danger of inflatable pools. 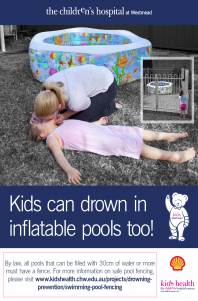 We have been working with KidsHealth – The health promotion unit of the Childrens Hospital at Westmead on drowning prevention campaigns and this summer have placed a focus on inflatable pools as they are beginning to feature more prominently in a number of drowning/near drowning cases. Inflatable pools are VERY cheap to buy and the point of sale information about the need for them to be fenced is completely inadequate. Unless people read the fine print they are extremely unlikely to be made aware at the point of sale that ANY pool that is capable of being filled with 30cm or more of water is required to be fenced in the same manner as a full scale in-ground pool. 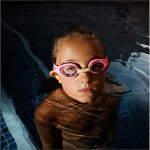 Empty the pool after use; as soon as activity involving the pool is over the pool should immediately be emptied. Children have drowned after slipping out of site and returning to the water.. and it only takes 5cm of water for a child to drown. Deflate or store the pool; deflate the pool, or store it in a garden shed. This will prevent the pool collecting rain water, or children refilling the pool. Write to your local member of parliament and ask them to advocate for changes to fair trading rules around the sale of inflatable type swimming pools. 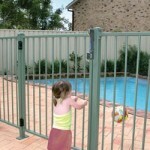 There needs to be VERY clear information about the requirement for pool fencing and water safety advice provided by the vendor at point of sale. How can you find your local member of parliament?